This is, it seems, open season for name calling against the media. The union minister and former army chief, General V.K. Singh, describes journalists as 'presstitutes'. He has probably, like a good officer, taken his cue from his 'boss' - after all, didn't Narendra Modi repeatedly refer to journalists even mildly critical of him as 'news traders' in the run-up to the 2014 Lok Sabha elections? Doesn't the Prime Minister follow troll armies on social media who abuse journalists constantly? And didn't the PM also term opinion polls showing the BJP losing to AAP in Delhi as an example of 'bazaaru' media? When the supreme leader of this government shows contempt for anyone in the media who raises uncomfortable questions, then why expect one of his ministers to be any different? And not to be outdone, Delhi Chief Minister Arvind Kejriwal dismissively calls the media 'bikau' or 'bought'. This article is not meant to be a defence of my tribe. There is enough evidence to suggest that a section of the media has lost its moral compass, transformed itself from watchdog into lapdog and has completely embedded itself with the power elite in a manner that would make Pyongyang's state media blush. In a media universe where sensation replaces sense and trivia triumphs over the truth, then there is every chance of our professional credibility being attacked. The tyranny of TRPs, in particular, has meant that the visual news media is under serious pressure to press the hype button in the competitive desire for greater eyeballs. This regressive streak might explain, for example, why some news channels chose to perhaps deliberately misread the sarcasm in Singh's remarks, comparing his leadership of the Yemen rescue efforts with his attendance of the Pakistan national day celebrations. It is also true that some news organizations under owner pressure consciously tried to 'defeat' Kejriwal during the Delhi election campaign, a trend I call 'supari' journalism. And yet, when senior public figures seek to browbeat the media, it is time to protest. For Singh to describe journalists as 'presstitutes' is an affront to those who do their job with dedication. The general's military training may well lead him to see the world in terms of 'allies' and 'enemies', but this tendency to be caught up in a 'them' versus 'us' bipolarity only reveals an intolerant streak that should have no place in a liberal democracy. While partially apologizing to the media later, the general again stoked controversy by rather ludicrously claiming that arms lobbies were behind the media campaign against him. Sadly, in the era of prime-time cacophony, there is a tendency to confuse the noise with the news - the news is that 90 per cent of journalists use their pen and their mike to good effect, often in difficult circumstances. Labelling a profession in derogatory terms based on individual grudges is dangerous. It points to disrespect for an institution akin to those who heap scorn on netas by screaming 'Sab neta chor hain' (all politicians are thieves). Both Modi and Singh may well claim that they have been subject to personal calumny in the past. Modi, in particular, has been called 'bhasmasur', 'frog', 'Maut ka saudagar'. This abuse, often by his rivals, is unacceptable and was one of the reasons why the PM was so successful in projecting himself as a 'victim' of the Congress's vilification campaign. But let us also not forget the derogatory epithets that Modi has used in the past against the Gandhi family, or the manner in which he once described Shashi Tharoor's late wife, Sunanda Pushkar, as a '50 crore girlfriend'. This coarse language should have no place in public discourse, certainly not when one seeks to project oneself as a statesman politician and not just a demagogue. More dangerous is the message that is now being imbibed by the cheerleaders of the BJP. If any criticism of the government is seen to be an example of 'presstitution' or 'news trading', then there seems to be a deliberate and insidious attempt to muzzle all dissent. Already, NGOs, lawyers, human rights activists - who challenge the government in any manner - are finding themselves under the scanner. Drawing a parallel with the Emergency years would be an exaggeration at this stage, but there is little doubt that there is a concerted attempt to target and isolate anyone who raises discomfiting questions even while amply rewarding those media persons who are little more than fellow travellers of the government. In the social media space, where Modi's supporters have a dominant presence, there is ample evidence of how anyone who challenges the dominant narrative is labelled 'anti-national', 'paid media', 'pseudo-secular' and worse. In an era where Twitter trends are seen to guide public debate, there is a worrying trend to defame, intimidate and vanquish all contrarian voices. Shockingly, Singh has gone to the extent of virtually goading an abusive troll army on Twitter to attack journalists who have criticized him. Perhaps, if there was social media in the 1970s, Indira Gandhi's hatchet men would have done the same. The question is, does Modi, who cut his political teeth by bravely opposing the Emergency, wish to move in the direction of Gandhi as an autocrat who demands a pliant media? And does he want to have, in his Cabinet, a minister who is running a sustained malicious campaign against the fourth estate? Postscript: When Modi called the media 'bazaaru' for publishing opinion polls that showed the BJP trailing AAP in the 2015 Delhi elections, I must confess to feeling concerned that if our polls went wrong, we would be singled out. Journalists have little to do with poll findings, but channels are still held accountable for the final numbers. Not surprisingly, when AAP did win 67 out of 70 seats, I didn't hear a squeak from the government propagandists that their leader had got it badly wrong. Such is the perilous life of modern-day journalism. Author's note:The attacks against journalists who ask questions of the government continue unabated. In May 2018, the popular NDTV India anchor, Ravish Kumar, claimed to have received death threats and has now been given security. Others, too, including this writer, have faced routine threats and abuse. The Prime Minister and a few union ministers continue to follow Twitter handles that viciously attack journalists. India ranked 138 in the World Press Freedom Index in June 2018. 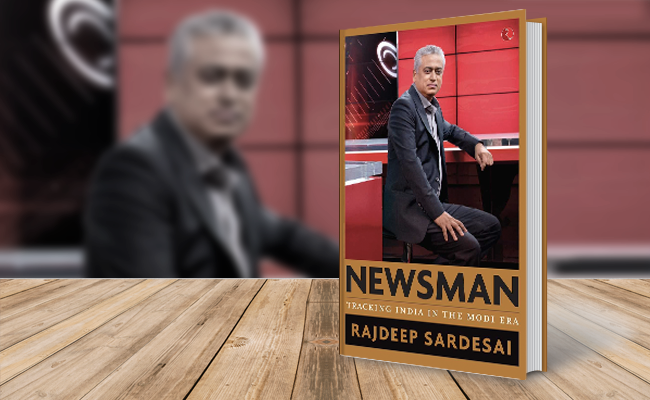 Excerpted from Newsman: Tracking India in the Modi Era by Rajdeep Sardesai with permission from Rupa Publications India. Order your copy here.